Yet Another Tech Show coming at ya! It’s YATS, everyone. Welcome to this week’s show. I’m Ant Pruitt with super producer Mat Lee, Larry Press and Attack of the Androids co-host Nick Carroll. This is the weekly podcast you can come to and enjoy some informative yet entertaining tech discussions. Take a look this week’s show notes as you listen to the show and follow along. Mat has been on a spending spree recently. New mobile devices as well as new laptops. Now that he has all of the extra devices, he needs better performance out of local area network (LAN). We discussed the new router he picked up from Netgear and the specifications of it. In my opinion, the routers with extra speeds aren’t needed for everyone. Granted the dual band routers such the one Mat has is a nice investment as it keeps you off of the same frequency of other close by wireless devices. But yeah keep your money if you’re not going to take full advantage of the differences between the “G” and “N” routers. If you really want to geek out and maximize the use of your wireless router you can check the best frequency channel to use your devices, run WiFi Analyzer. If you want to easily share your WiFi password with guest, you can make a QR code for it with QR Droid. Thanks for the tip, Mat! Next we discussed internet freedom. It’s amazing how some countries in the world are in such bad shape not only when it comes to their internet speeds, but also the freedom to use the internet. 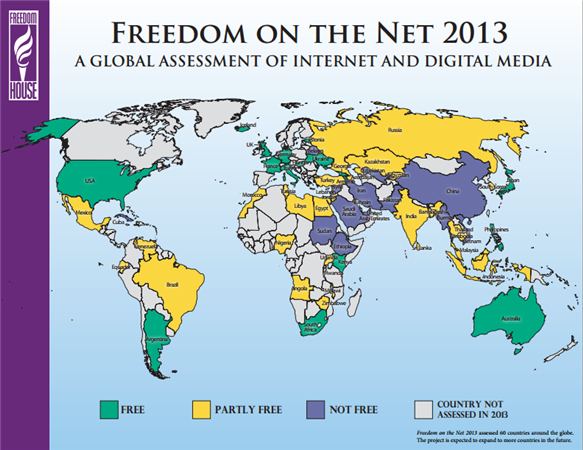 Lots of sites, services and even personal blogs are censored in some countries. There are restrictions on certain sites, sure, but what if you discuss certain government officials in a not-so-flattering way (in some countries), you can be fined. Larry shared more stats on a an online PDF he found from Freedomhouse.org. Sticking with the freedom discussion, we talked about the new content policy provided by social giant, Facebook. Apparently there was a video of a person being beheaded posted on Facebook. Of course this stirred a lot of controversy. What we have to understand that there are times when you have to work within the terms and conditions the social network has put in place. Sure everyone has the right to write what they want when they want to their Facebook accounts, but only if it’s within the guidelines of the social media service provider. Next the Surface Pro 2 from Microsoft grabbed a few headlines. The new tablet has the potential is to allow enterprise user bases to function normally as they do a laptop as their computing device. It’s light, fairly decent chipset and has the ability to run desktop applications such as Office. The Surface Pro also has a keyboard to help with using those apps. 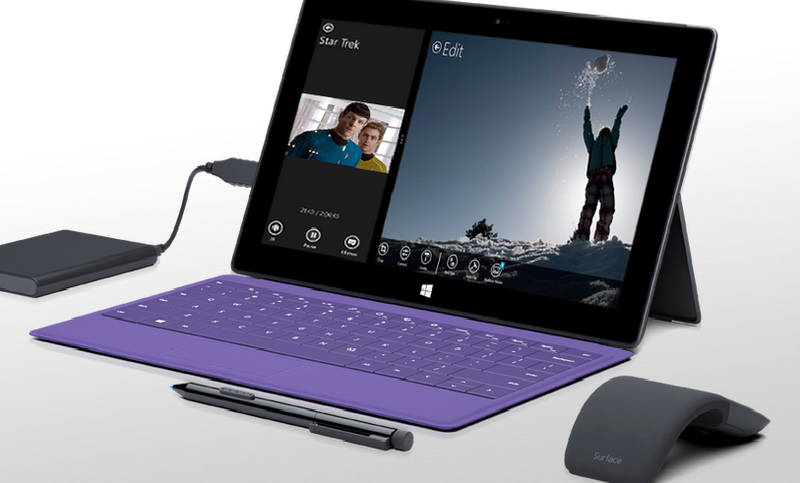 Most of us are skeptical about the future success of the Surface Pro 2. What do you think? Remember Aereo? The cord-cutting friendly company is now making more moves by releasing an Android app. Aereo’s service allows subscribers to stream television over the internet by using tiny antennas. The service is sounds great, but Larry questions the tech in use. YouTube has noticed the trend of today’s online users browsing it’s video service for not only funny cat videos, but also for music. The YouTube Android app is now being updated to allow for streaming audio in the background of your mobile device. Sounds good, but we find this a little odd as Google owns Google Music as well as YouTube. Interesting. Thanks again for listening to our show, everyone. We appreciate your support. Be sure to tell others about our show and share it to your friends on Facebook, Twitter and Google Plus. If you want to help support the show’s server cost, feel free to make a donation up on the right side of our page by clicking the donation button. Thanks!